Normally for the Monday Escape we focus on places that are cheap and very tempting for budget travelers or those looking for an affordable place to move to. But today all of that is out the window, as Santa Barbara, California could never really be considered ‘cheap.’ However, it’s so lovely and so unlike most of California that it’s worth mentioning anyway. And it doesn’t actually have to be as much of a splurge as you might think. Santa Barbara is about 100 miles north of Los Angeles, which actually puts it outside of the Greater Los Angeles area. It’s a historic beach town that tends to attract the idle rich, so the cost of living is actually virtually unaffordable for many. It’s so pleasant though, that many will sacrifice a lot to visit or even to live there. One thing that is constant in nearly all of California is the sprawl, where literally everything is built on a scale for those driving cars rather than walkers or those using public transportation. 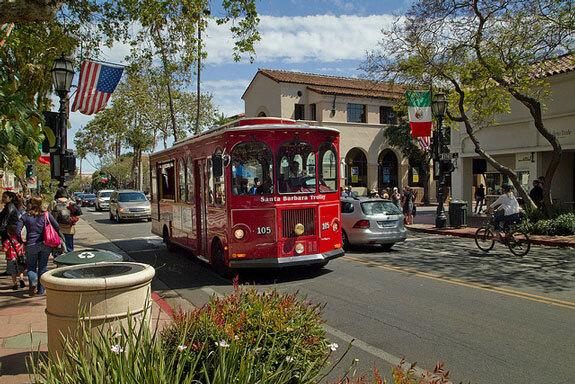 Santa Barbara is a major exception, which is one of its many charms. The downtown area focused around State Street was designed for a time when people actually walked from place to place. The gorgeous Santa Barbara Pier is at the end of State Street, plus some really nice public beaches. During the day the area seems mostly dedicated to upscale shopping and outdoor restaurants, but at night the State Street area comes alive with an impressive nightlife that attracts local college students as well as those staying in the fancy hotels nearby. This alone is so unique in California that it’s worth a look if you are the type who likes to try a pub crawl now and then. One slightly amazing fact is that there are so many bars and restaurants in the area, plus so many college students that are customers, that the places actually have to compete heavily in order to stay busy. This means that happy hour specials and other deals are easy to find by just walking up and down the street. There are a couple of larger shopping malls in the downtown area, but they are somewhat hidden so they blend into the small-town atmosphere. There are also scores of boutiques and smaller shops that are independently owned, so it’s not just an endless parade of Gap, Macy’s, and Hot Topic. Those with a car can get to more secluded beaches within 10 minutes or so, plus golf courses and a wide variety of other upscale activities. If you want to see where the richest of the rich live you can take a quick tour through Montecito, where Oprah’s mansion is one of the largest. Compared to most of the United States, Santa Barbara is on the expensive side for sure, but it’s actually not as bad as you might think. If you avoid the busiest summer weekends you can find hotels for under US$100 per night, even nice ones in the State Street area. There’s even a hostel and a few cheap hotels right along State Street, so it’s surprisingly backpacker friendly. Most of the restaurants you’ll see do tend to be on the pricey side, with the cheapest meals starting at at least US$10 and going way up from there. But there are some cheaper places mixed in, plus some sandwich shops and fast food options. You’ll also find that some of the bars have food specials during lunch and late at night, so there’s something for nearly any budget. Drinks are actually fairly reasonable compared to places like Hollywood and Santa Monica, since there is so much competition in a small place. Those on a budget can find pitchers of beer or other cocktails on happy hour specials, even at some of the nicer and busier places.